Strong, decisive, full-bodied, sharp taste. This blend has a higher percentage of Robusta composition. Just right to give you an energy boost. The ultimate expression of the Neapolitan tradition.Borbone Pods are..
BLACK Blend by Borbone in pods ESE 44mm!This is a well-balanced mix of Arabica and Robusta that combined with the perfect degree of roasting creates a perfect classic for espresso lovers. This is the blend f..
ESE system is a Patent Free and environmentally friendly coffee system. 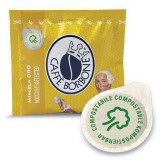 PODs are made of Paper and are self packed for freshness. 44mm ESE pods can be used with traditional Espresso Machines that use Ground Coffee, with ESE, Handpresso, Mokona and Tazzona machines. 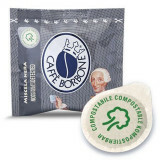 Would you like to know more or maybe replace your capsules machine with an ESE coffee machine? Contact us Today! 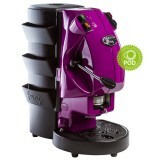 Frog - Black ESE pods Machine - Professional at home! Environmentally friendly Product - Professional at home!All the benefits of the single serve capsules brewers in a machine that uses ESE Pods and make a difference for the environment.Made in Italy the Frog ESE pod..
Quality Arabica beans decaffeinated with the used of water steam only. 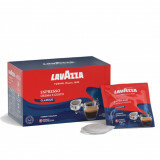 You will be surprised at the taste of this caffeine free coffee.A blend of 100% Arabica coffees beans from Brazil and GuatemalaPortorico.. Creating a great coffee is like creating a work of art! 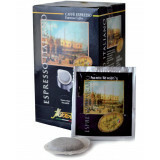 !The Art of Coffee Espresso Italiano is a blend for perfect aroma, fragrance, texture and flavour. this flagship product is made selecting the best qual..
Kimbo 100% Arabica blend produces an espresso with an intense aroma, persistent crema and delicate flavour.Each pack contains 18 simple and easy to use ESE Pods. Each single serving contains a perfect 7 grams of ground c.. 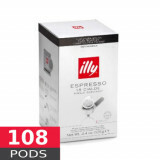 This classic, traditional Neapolitan dark roast is intense and full bodied, well suited for a stronger morning coffee with extra oomph!Each pack contains 18 simple and easy to use ESE Pods. 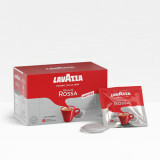 Each single serving contains a..
100% Arabica beans for the true connoisseur. Mild, smooth and refined. 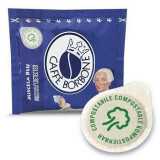 Less caffeine with tones of sugar, fruit and berries. Delicious as an after dinner coffee.Borbone Pods are perfect for hotels, cafes and resta..
Caffè Borbone blue blend is the right mix for determined and demanding palates, for who prefers a coffee with a full-bodied and creamy.By balanced, round, full bodied, creamy taste and at the same time perfectly ..
Illy Caffe Dark Roast Italian Coffee Pods create a fantastic tasting coffee which can be enjoyed at any point in the day. 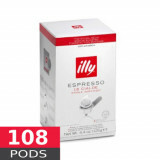 Whether you are relaxing at home or enjoying a refreshing break from work Illy Caffe Dark Roast It..
Illy's hugely popular medium-roast (Tostatura Rossa) espresso pod -- individually-wrapped. 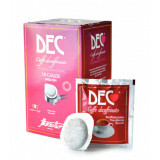 100% Arabica coffee. 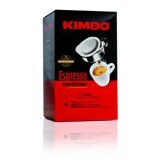 Quintessential balance of strength and gentleness, with distinct aromas of chocolate, toast, cara..